Begin your transfer tour with a pick-up at your downtown hotel at 10 am. Complimentary beverages and snacks are provided for your comfort. During our scenic drive down Turnagain Arm, your guide will point out possible wildlife like sheep, mountain goats, beluga whales, and eagles. We’ll make a photo stop at the famous Beluga Point for some beautiful views and a great backdrop for stunning photography! Next, we’ll visit the quaint town of Girdwood for the aerial tram ride up the longest double black diamond ski slope in North America. From the top you can view several glaciers and the farthest northern reaches of a temperate rainforest that stretches from here all the way south to Northern California. On select days our guests visit the Roundhouse Museum. This museum is perched on the mountainside and surrounded with a panoramic viewing deck for your viewing pleasure. Then we’ll visit our favorite Girdwood bake shop for lunch (included) and bottomless homemade soup, sourdough bread, beverages, and dessert. Next, visit the Alaska Wildlife Conservation Center, located on 140 acres at the southern edge of Turnagain Arm. The Alaska Wildlife Conservation Center provides wildlife education and awareness, and care and rehabilitation for Alaska’s wildlife. Get close, safely observe and photograph some of Alaska's largest land animals, including moose, bison, elk, deer, caribou, bears, and musk ox. Our guests also enjoy seeing small mammals like lynx, and stunning birds of prey, such bald and golden eagles. 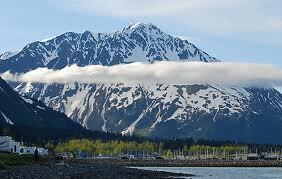 Then we’ll explore Portage Valley. Several Alpine glaciers can be seen here and, depending on the season, you may be able to view salmon spawning in one of the small creeks! Finally, enjoy a ride through the 2.5 mile Anton Anderson Memorial Tunnel, the longest one-way train and vehicle tunnel in North America. We’ll arrive in Whittier at approximately 3:30 pm and transfer you directly to your cruise ship. Have plans to stay at a Whittier hotel? We’ll be glad to drop you off at the hotel of your choice.